If you are looking for a unit with large volume capacity, look no further! 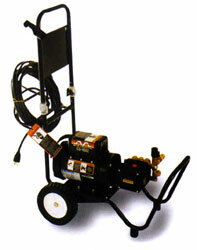 The Mi-T-MÂ® 2000 PSI Pressure Washer is the ideal choice. The CD Series works well in industrial applications that require 20 or more hours per week - this model is built for longevity. The top-fired heat exchanger is energy efficient and designed for convenient troubleshooting. Not to mention, this pressure washer is quiet and works perfectly for those tough, industrial jobs.